Continuing our journey from Atlanta to the West coast, Bill and I ended up in the Bay Area in late June. 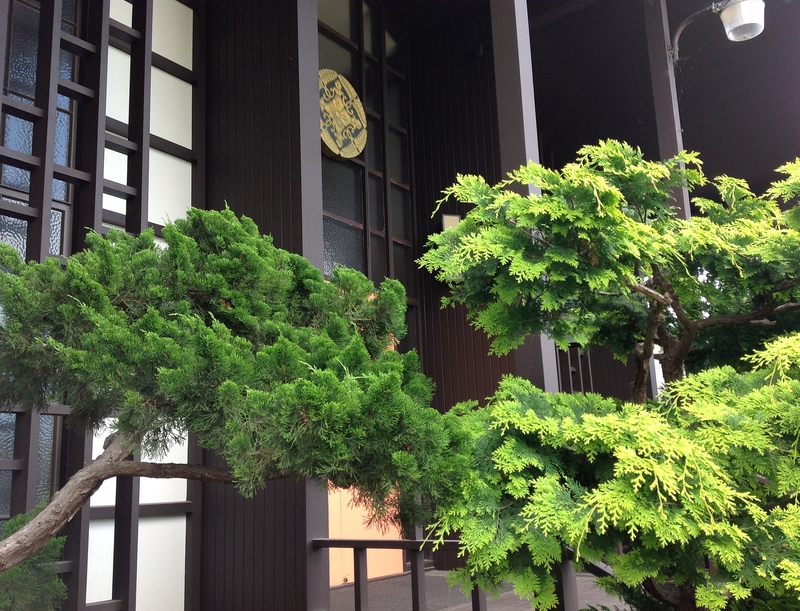 Wandering down a street in Berkeley, we came to the Higashi Honganji Buddhist temple at 1524 Oregon Street. 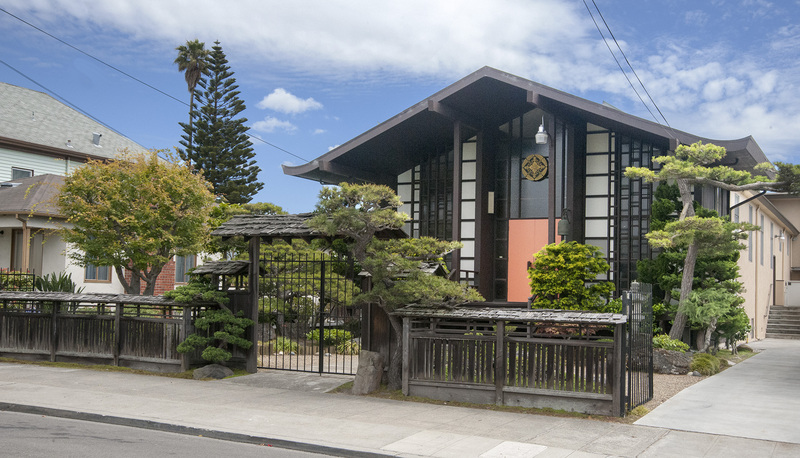 Built in the 1930s, the Berkeley Higashi Honganji Buddhist Temple now serves a diverse congregation. A long-time member of the sangha told us Rev. Ken Yamada is the current minister and more information on the temple is available at their web site http://www.bombu.org or by phoning (510) 843-6933. Established in Berkeley in 1926, the current temple was built in the late 1930s. A social hall and classroom building was added in the 1960s and was undergoing repairs the day we were there in June. 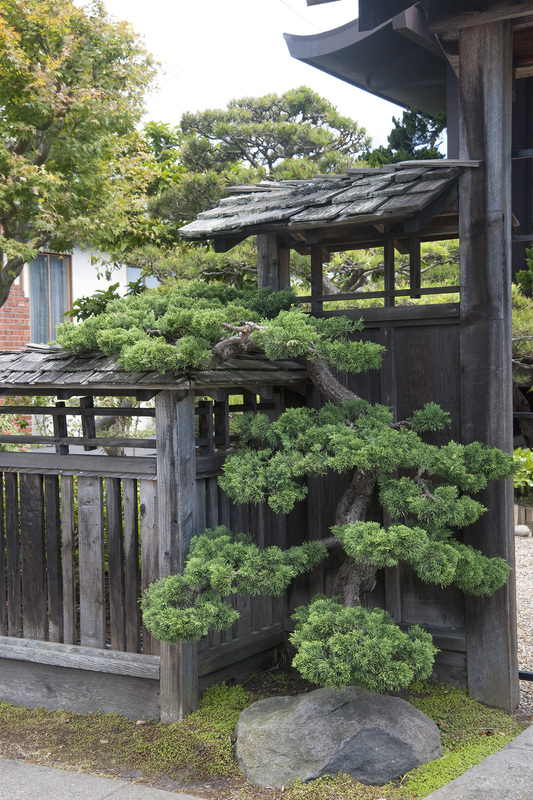 Carefully shaped, the evergreen hugs the top of the front fence adjacent to the gate. The front garden replaced a lawn on the occasion of the temple’s 60th anniversary. As members aged, maintenance of the trees became difficult. 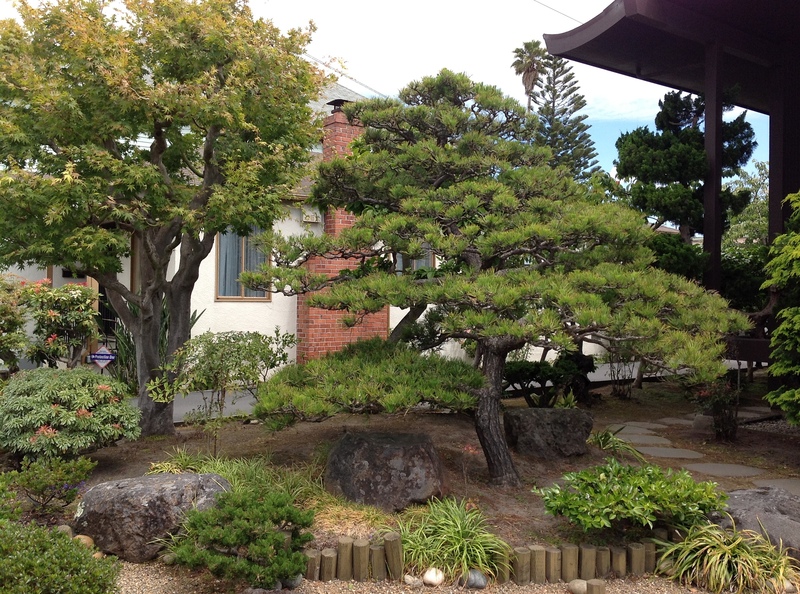 About 10 years ago Dennis Makishima, former president of the Golden State Bonsai Federation, got involved with the garden. His mother is a member of the sangha. Dennis got a call from the minister which resulted in the temple garden being added to the Merritt College Aesthetic Pruning Club volunteer events calendar twice a year. The pine tree at the left side of the yard is close to 100 years old. 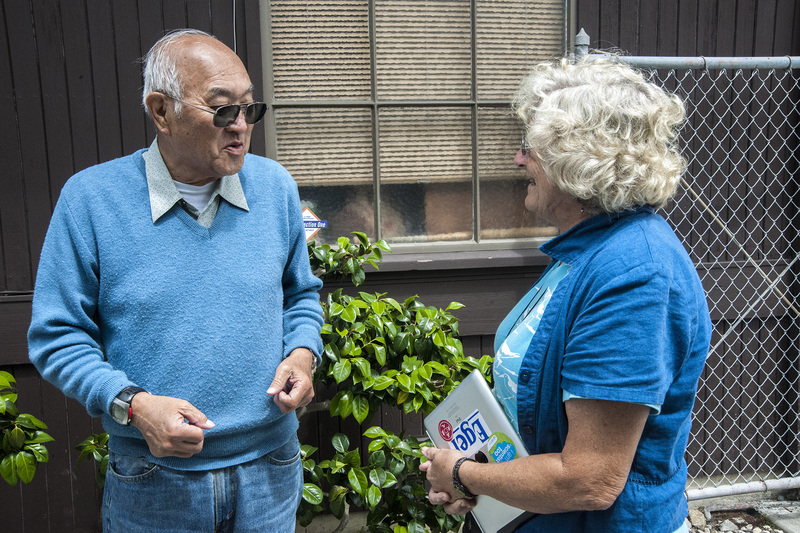 Dennis Makishima started an aesthetic pruning course at Merritt College in Oakland which led to the formation of the pruning club in 1987. 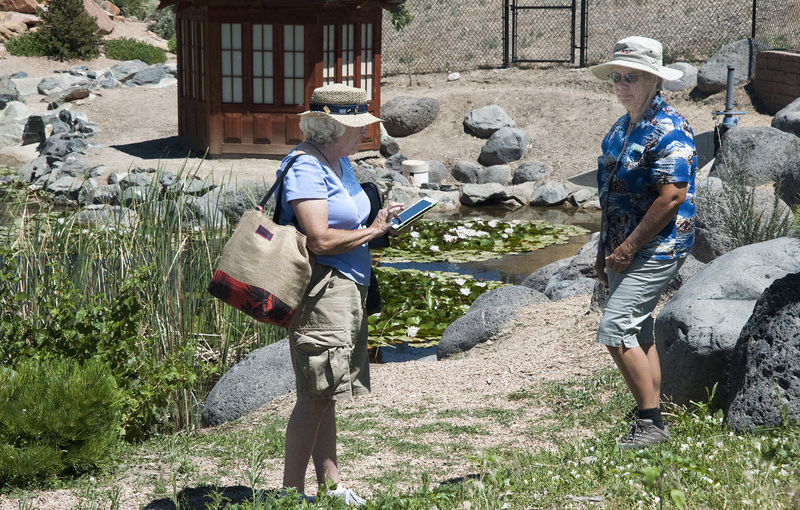 Members of the club also volunteer monthly at the Lake Merritt Japanese Garden and at Hakone Gardens in Saratoga. 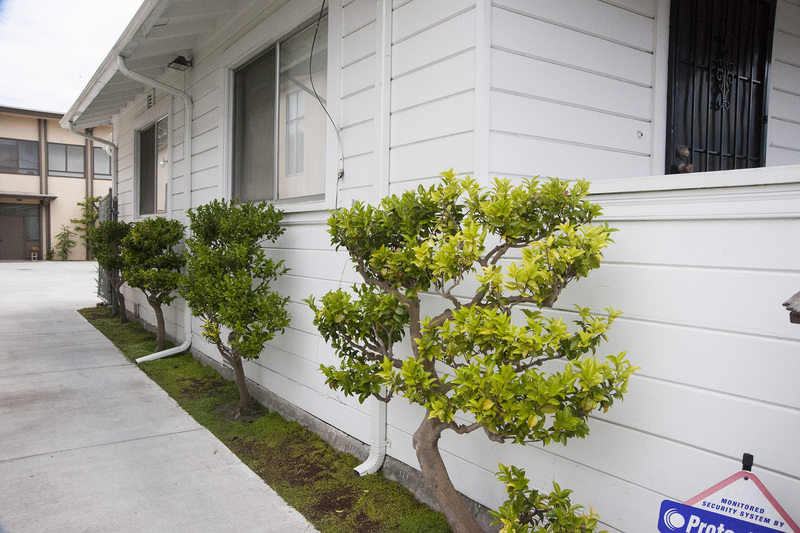 Espaliered camellia bushes line the minister’s residence and the driveway between the home and temple. The social hall and classroom building is visible at the end of the driveway. Comments on this article and other stories on this blog are welcome. Photographs not otherwise credited are by K.T. Cannon-Eger. To view any photo full size, just click on the image. 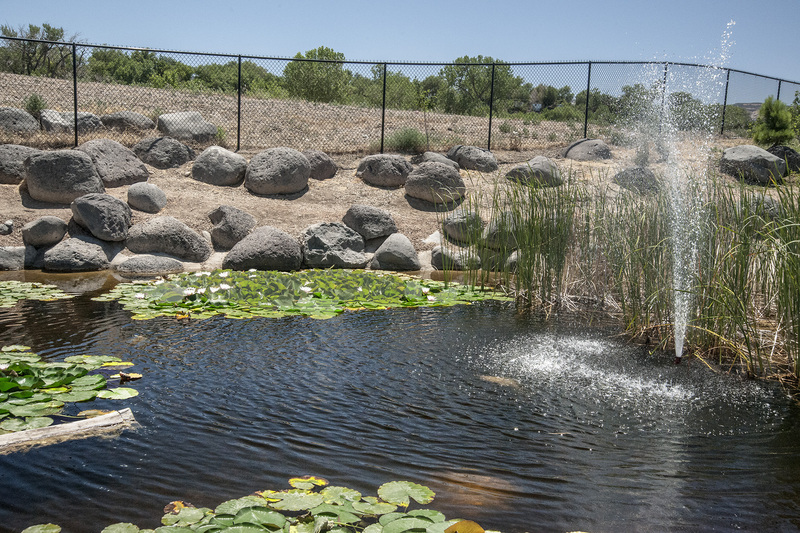 A new fountain, adjacent to the gift shop, graces the entry to the Western Colorado Botanical Gardens. 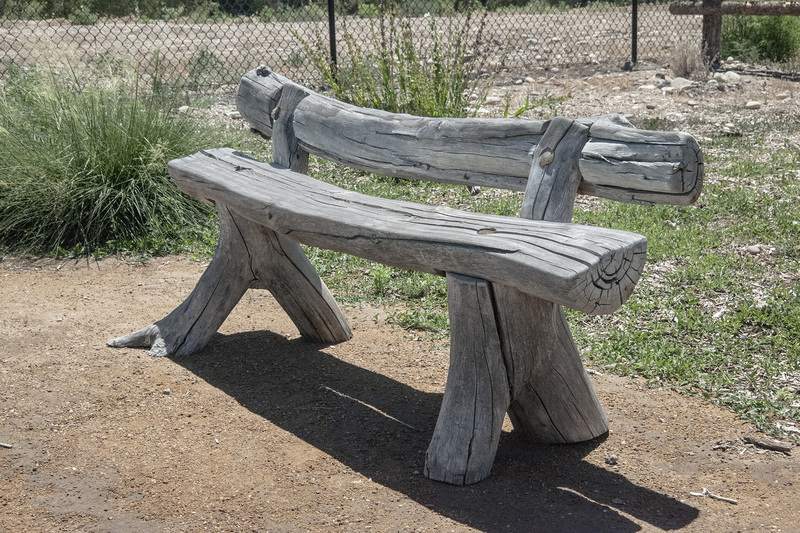 The Western Colorado Botanical Garden, located in Grand Junction, is one of several legacies of the late landscape architect Robert “Bob” Arcieri who passed away while on a hike in the remote canyons of Utah in 2007. He was born in Grand Junction to William and Sabbie Arcieri, the owners of the Arcieri Nursery on First Street. It was at this nursery that Bob’s love of nature and knowledge of plants developed and grew into a lifelong passion, according to the Summit Daily News. A 1961 graduate of Grand Junction High School, senior class president and an Eagle Scout, Arcieri attended Stanford University for two years and then transferred to Iowa State and graduated in 1966 with a Bachelors of Science Degree in Landscape Architecture. He was inducted into the Honor Society of Agriculture and the Honor Society in Architecture and Allied Arts. He continued his education at Iowa State, graduating with a Masters Degree in Urban Planning in 1968. Bob moved to Breckenridge in 1970 and with Architect Jon Gunson formed the Harris St. Group, an architecture and planning firm which designed the sidewalks, lights and landscaping on Main Street as well as the town’s Master Plan, development code and historic guidelines which are still in use today. The firm received numerous awards, including the American Institute of Planners Meritorious Program Award and the State of Colorado Columbine Award for Design Excellence. In 1982, Bob and his wife Deb moved to Grand Junction, where Bob practiced as a Landscape Architect. He received numerous landscape awards for gardens in Grand Junction, many in conjunction with Bookcliff Gardens. “Bob’s legacy will live on in the beautiful gardens, waterfalls, and changed landscapes in Western Colorado,” said his obituary in the Summit Daily News of October 13, 2007. The Western Colorado Botanical Gardens is one such changed landscape. There are 15 acres in the botanical gardens and ten named gardens. Although the organization has had some difficulty raising money in the past, things are looking up. “Repairs in the greenhouse were completed and we reopened three months ago. The gift shop helps support garden,” said Frey. A mutually beneficial partnership is underway with Mesa Developmental Services, a non-profit group that assists persons with developmental disabilities. 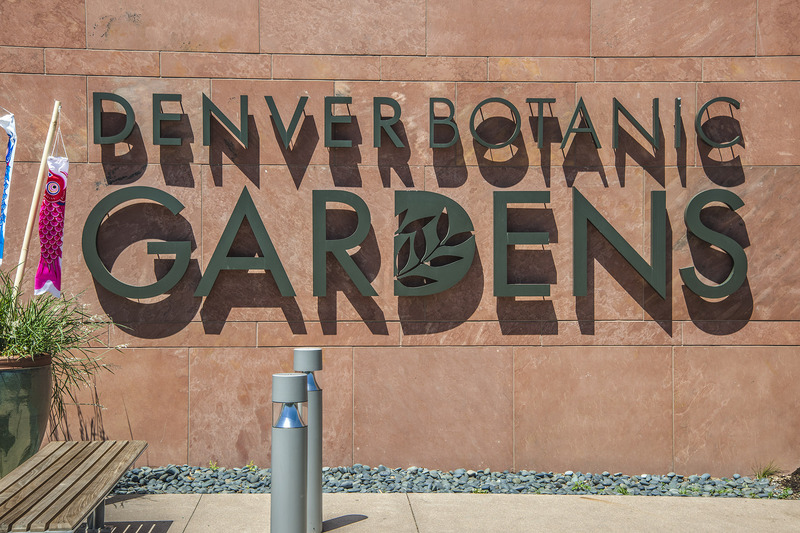 The gardens also enjoy collaboration with Colorado State University. “The rose garden was just planted last year and includes century old rose varieties. The cactus society takes care of the cactus garden, the herb society and orchid society help out too. The bonsai club meets here once a month,” Frey said. Among plants featured in the Japanese garden are a recently planted weeping white pine, a weeping crabapple planted on Earth Day, weeping cherry trees, Black Hills spruce and pine. The small garden structure was designed to camouflage the pump house. A bridge remains to be built at the concrete lined pond planted with water lilies. Local stone has been used throughout the garden. K.T. interviews Margie Frey, the structure in the background hides pump equipment. Photos not otherwise credited in this blog are by K.T. Cannon-Eger. Click on any image to see it full size. Comments are welcome. Comments on this and other articles in this blog are welcome. 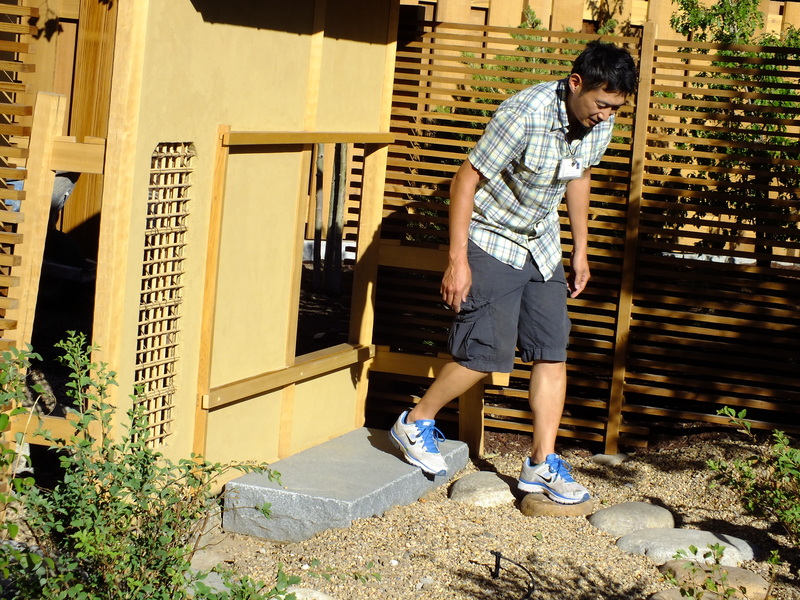 After obtaining his degree in horticulture in Japan and interning at the Chicago Botanic Garden, Akiyoshi (Ebi) Kondo joined Denver Botanic Gardens as a Horticulturist in April 2000 and was in charge of the display gardens and collections. 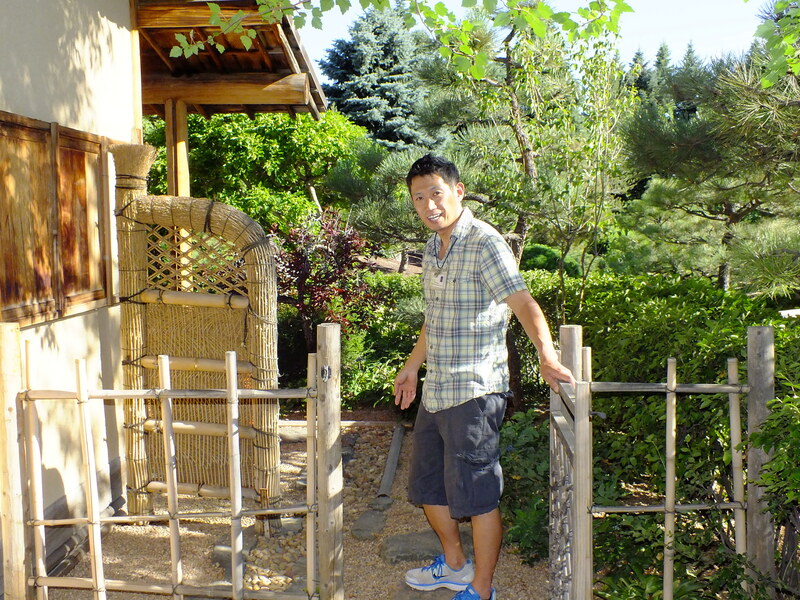 In 2003 Ebi was promoted to Senior Horticulturist and took responsibility of Sho-Fu-En, Denver Botanic Garden’s Japanese Garden. 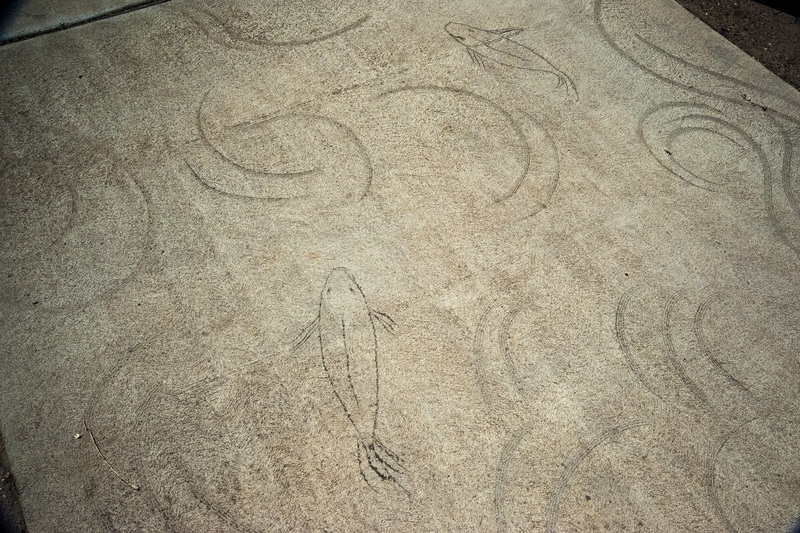 Originally designed by Koichi Kawana, construction on the two acre garden began in August 1978. 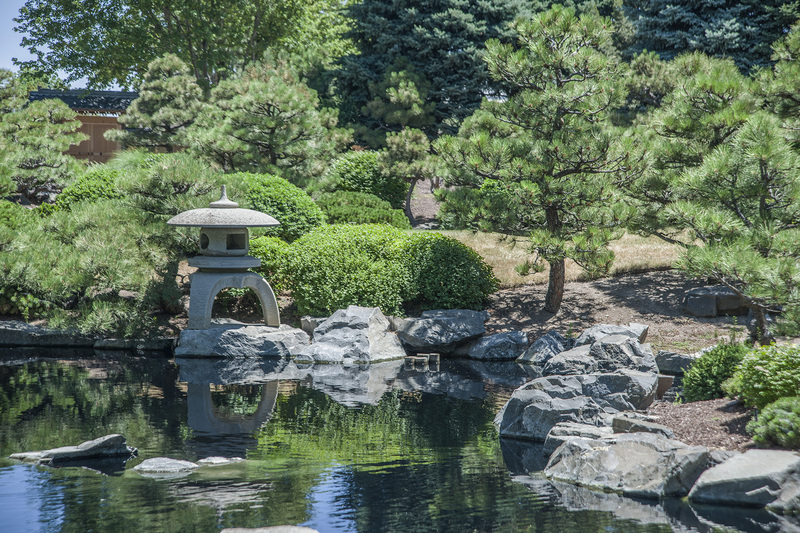 Sho-fu-en, Garden of the Pines and Wind, was dedicated June 23, 1979. “This was designed to be a provincial garden. Gifu-ken and Takayama-shi are next to the Nagano mountains, a very rugged area. Here we are amid the Rocky Mountains, also a rugged area,” Kondo said. A simple clean pond edge, a clear reflection, careful maintenance, the contributions of garden designers and gardeners since 1978 all add up to the shibui feeling of Sho-fu-en. 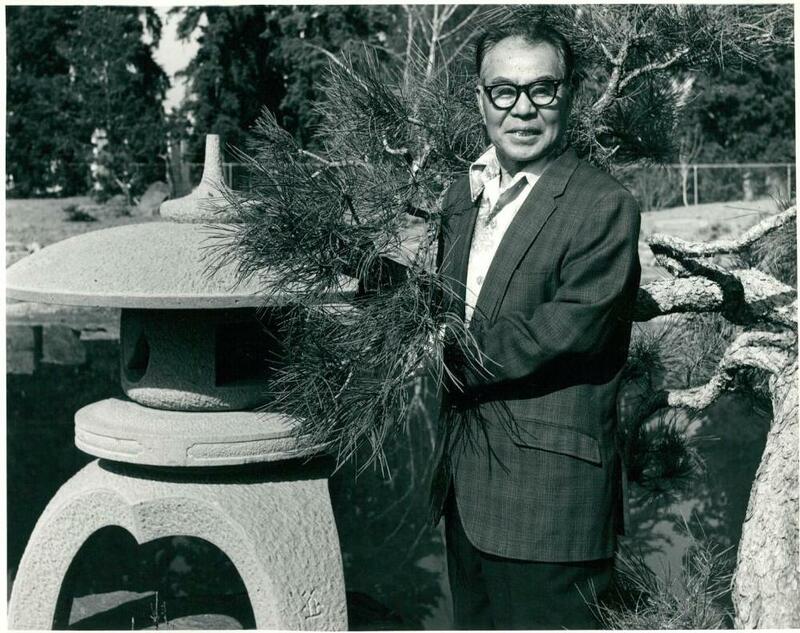 Koichi Kawana designed gardens in St. Louis, Missouri; Chicago, Illinois; Memphis Tennessee; Los Angeles and San Diego, California among others. The Hokkaido native who became a U.S. citizen in 1971 died in 1990 at the age of 60. Ebi Kondo holds open the gate to the 1979 tea house at Sho-fu-en. Built by Kumo Construction Company in Nagano, the tea house was disassembled and shipped to Denver. Company president Mr. Toshitame Hirabayashi and eight co-workers reassembled the teahouse along with the bridge and entry gate in 14 days. The teahouse was donated by the Eleanore Mullen Weckbaugh Foundation. When the garden started, more than 130 character pines were moved from nearby Estes Park by the Rocky Mountain Bonsai Club. Permits were obtained from the U.S. Forest Service to collect Ponderosa pines. 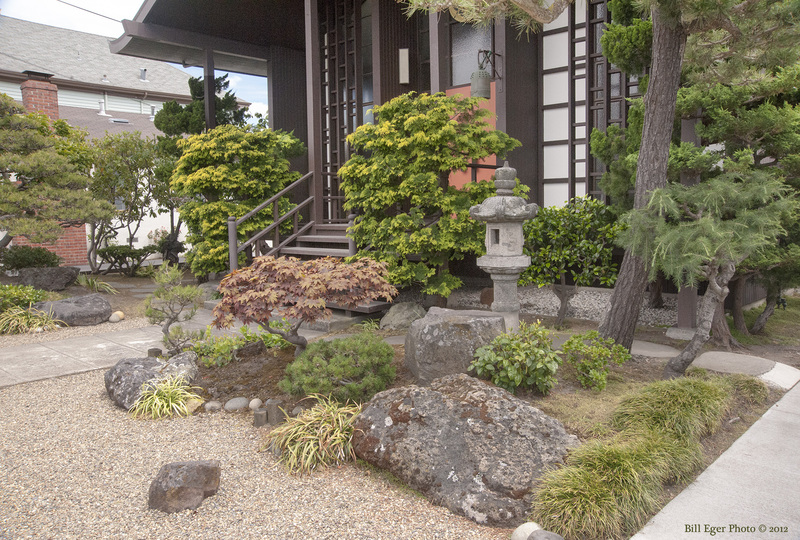 “Japanese gardens encourage the use of native plants. We have about 50 percent natives in this garden,” Kondo said. 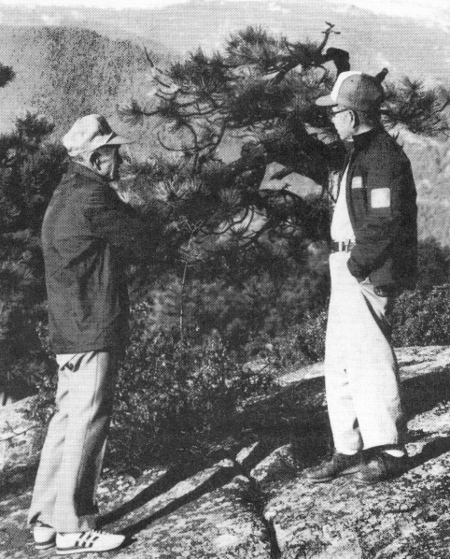 Bob Kataoka and Kai Kawahara inspect pines near Denver for possible inclusion in the garden. In 1977, Bob Kataoka, Kai Kawahara, Harold Sasaki, Floyd Sunshine, Bob Krueger, Keith Jepson, Larry Jackel and Malcolm Correll manned the first flatbed truck collecting eight or ten pines that trip. Kai Kawahara, was a gardener at Sho-fu-en from 1980 to 1993. He was one of eight founding members of the earlier Denver Bonsai Club that merged to form RMBC. As sometimes happens in the history of Japanese gardens in America, there came a period of disinterest, low funding and lack of maintenance. By 2000, the garden was in disrepair. “A garden without maintenance for even one season may take ten seasons to reclaim,” Kondo said. 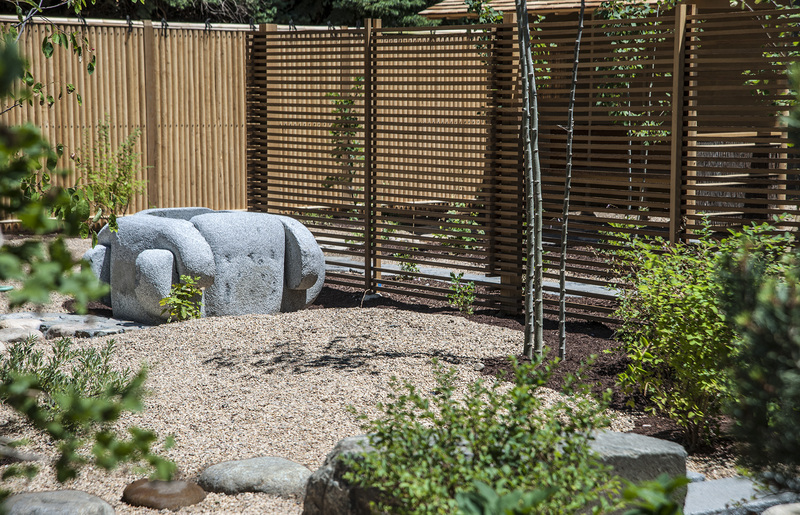 He undertook the initiative of the garden’s restoration reaching out to Mr. Seki the Consulate General of Japan in Denver and ultimately partnering with Mr. Sadafumi Uchiyama from Portland Japanese Garden. Sadafumi Uchiyama created a master plan for the development of Sho-fu-en in 2003. Phase one included a minor repair of the Tea Ceremony House/garden path ways and phase two encompassed restoration/ renovation of the existing lake and was completed over the following years. Some lanterns are designed for display near water. In 2007 with help from the Hosokawa Grant, Kondo founded Denver Botanic Gardens tea ceremony guild Sho-Fu-Kai. 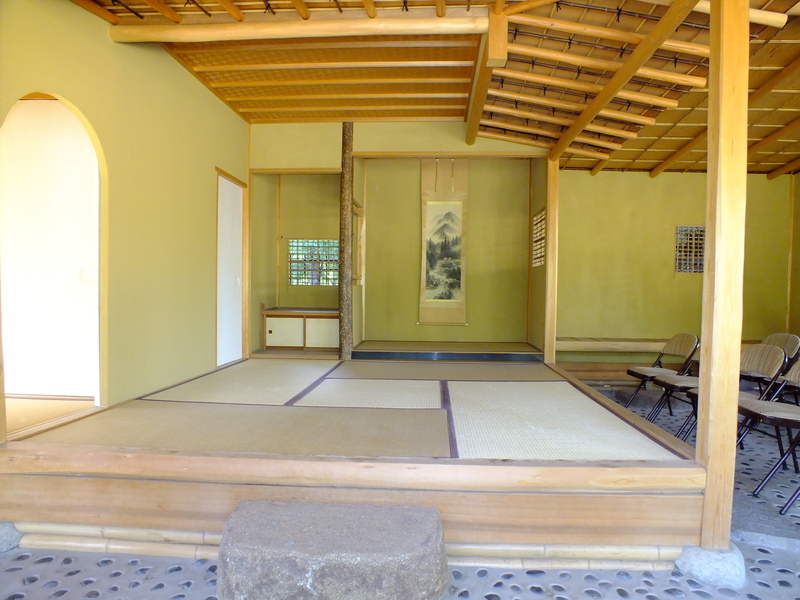 The guild’s mission is to expose the public and garden patrons to Japanese Tea Ceremony and support the Sho-fu-en. 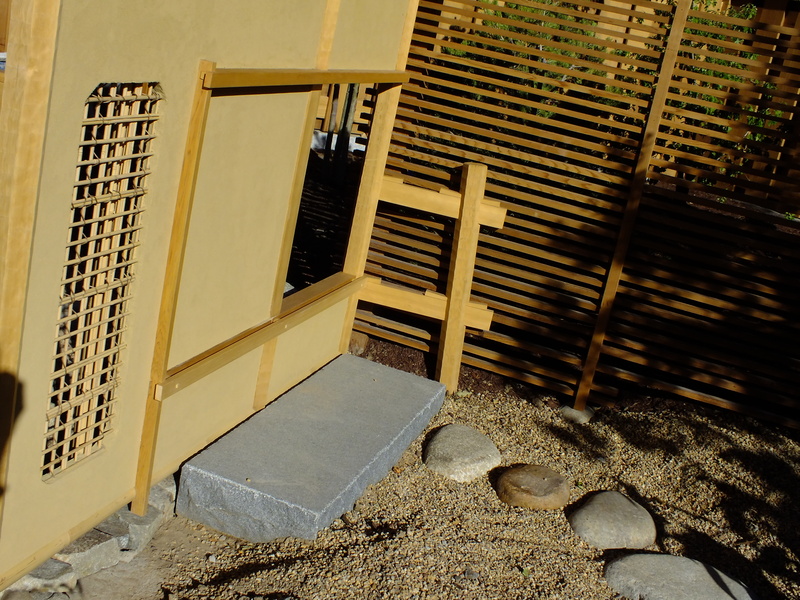 A new machiai, rojimon (gate), obote senko design, uchi roji (inner path), and soto roji (outerpath), were added to the tea garden, opening to the public in mid-June this year. Sadafumi Uchiyama arranged for the new well at the tea garden to be shipped from Portland, Oregon. 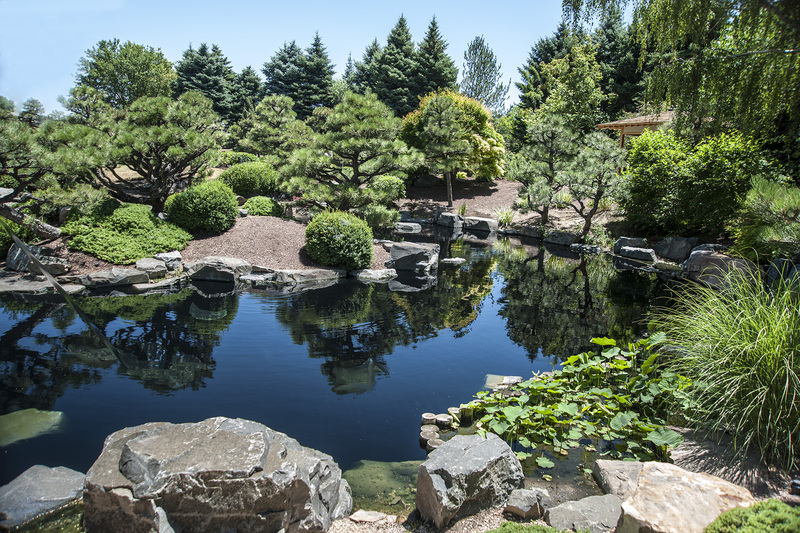 Now, Sho-fu-en is one of a few signature gardens at Denver Botanic Garden.”We work hard to keep our volunteers happy and enthusiastic,” Kondo said. “We have monthly cultural nights, and regularly scheduled nature hikes and movie nights. Future programs in development at Sho-fu-en include the Horticultural Therapy Program and Volunteer Docent Program. 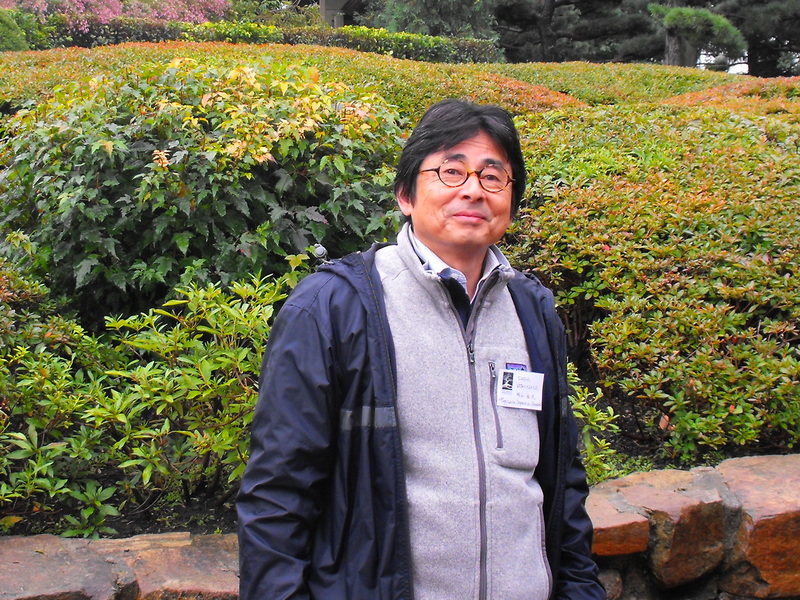 Kondo and Uchiyama are among the leadership members of the North American Japanese Garden Association (NAJGA), an organization newly formed for the purpose of networking public Japanese Gardens in North America. Kondo also is a member of the Japan America Society of Denver. 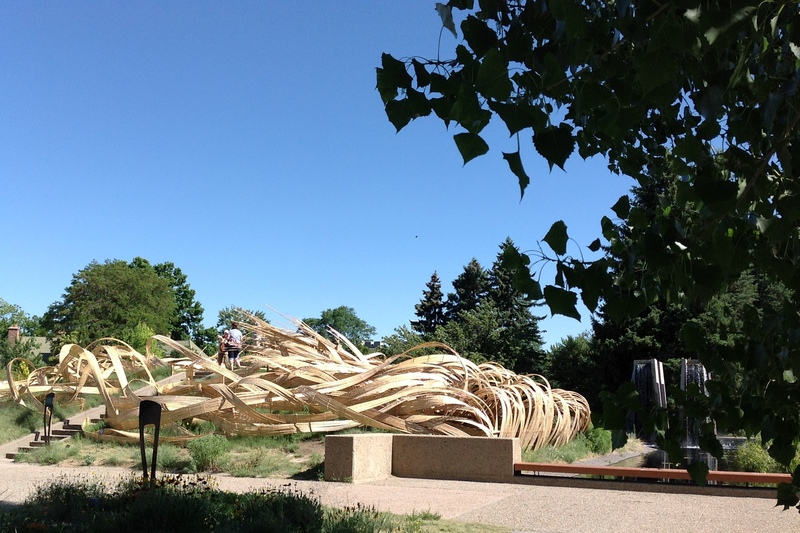 Please feel free to comment on your experience with Denver Botanic Gardens and Sho-fu-en in the comment box below. 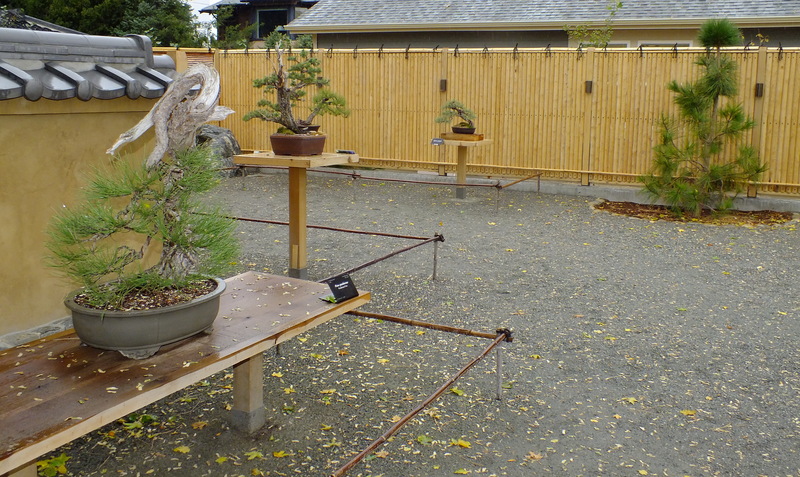 In addition to the Japanese garden, there are displays in other parts of the botanic garden grounds. 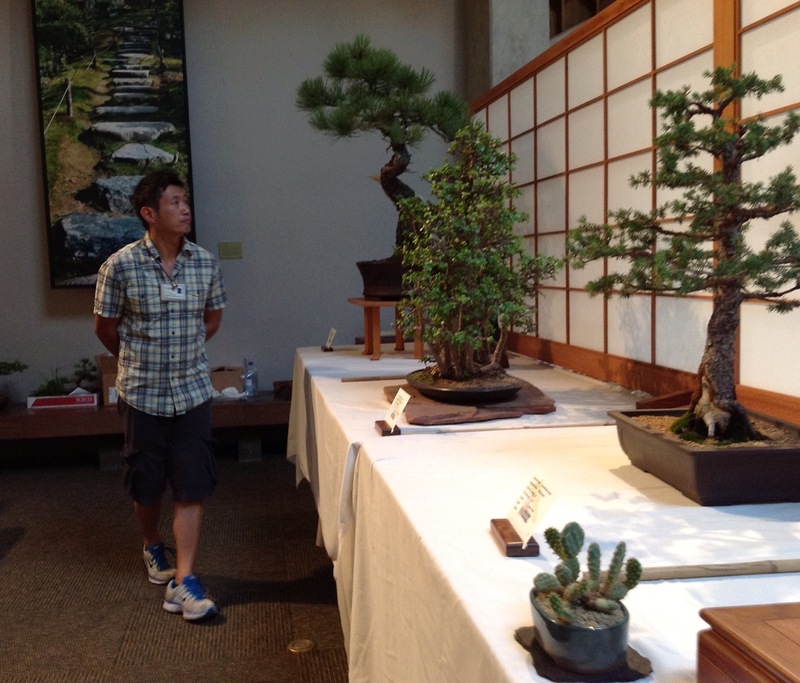 The bonsai club continues to hold juried shows and sales at Denver Botanic Gardens. This one was held Father’s Day weekend 2012. 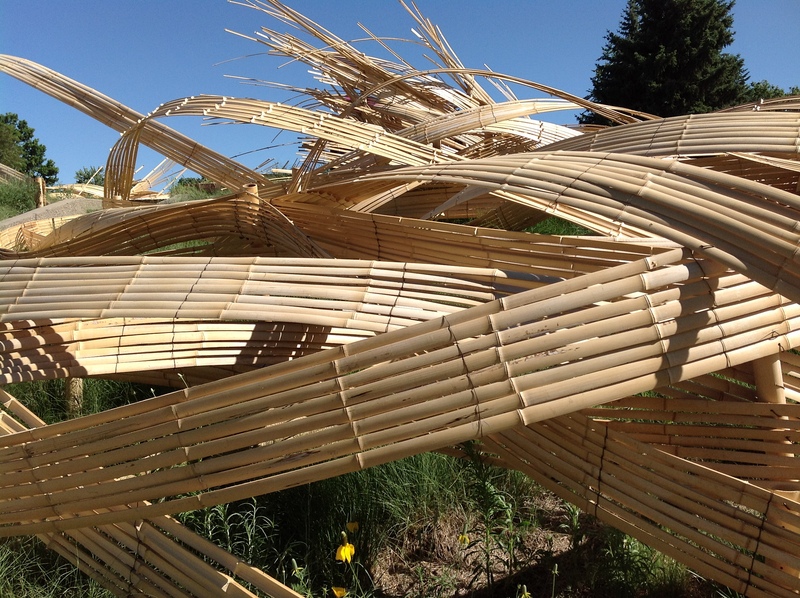 Kizuna — West Meets East, a series of site specific bamboo installations by Tetsunori Kawana from Japan and Stephen Talasnik from America, continues through November 4. 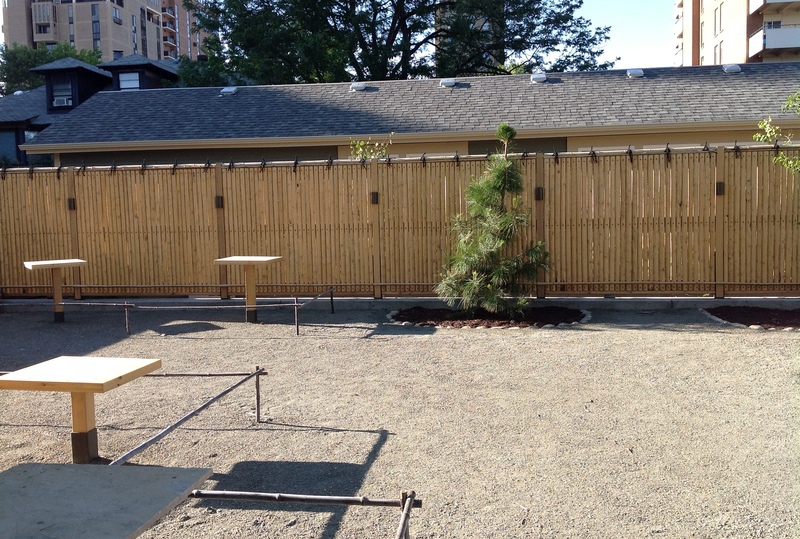 Also in mid-June 2012, a bonsai pavilion and courtyard opened as a memorial to the late news writer Bill Hosokawa. It was funding from the Alice and Bill Hosokawa Fellowship that helped Sho-fu-kai, the tea ceremony guild, form in 2008. The Bill Hosokawa Bonsai Courtyard after a rain storm, Saturday, Oct. 13, 2012. To view a full size image of any photo, just click on it. Photographs not otherwise credited in this blog are by K.T. Cannon-Eger.